ERROR ITMS-90474: “Bundle Invalid. iPad Multitasking support requires there orientations:’UIInterfaceOrientationPortrait,UIIinterfaceOrientationPortraitUpsideDown,UIInterfaceOrientationLandscapeLeft,UIInterfaceOrientationLandscapeRight’. Found ‘UIInterfaceOrientationPortrait’ in bundle. 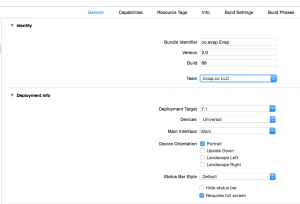 This entry was posted in How to make an App, iOS/iPhone/iPad and tagged ipad multitasking, xcode7. Bookmark the permalink.